Brown & Cohen may be an independent public and government relations firm, but international connections have helped set it apart from the crowd. Being the only firm in the country that’s a member of Public Relations Organization International (PROI) Worldwide is quite a feather in the cap of the Toronto-based firm. 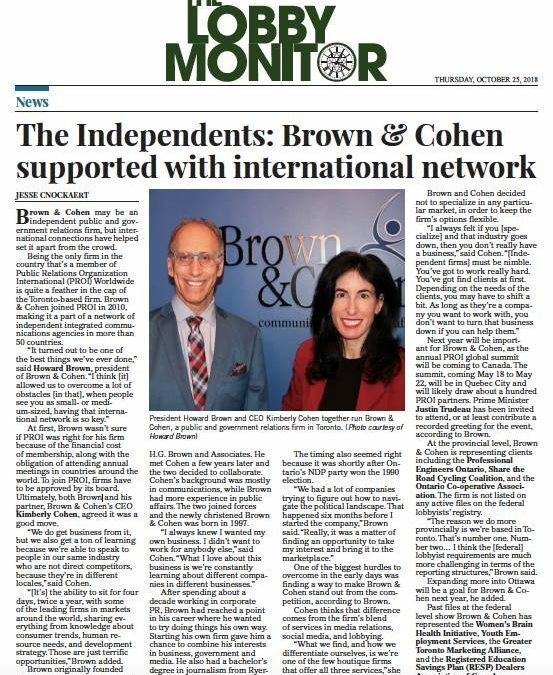 Brown & Cohen joined PROI in 2010, making it a part of a network of independent integrated communications agencies in more than 50 countries. At first, Brown wasn’t sure if PROI was right for his firm because of the financial cost of membership, along with the obligation of attending annual meetings in countries around the world. To join PROI, firms have to be approved by its board. Ultimately, both Brown and his partner, Brown & Cohen’s CEO Kimberly Cohen, agreed it was a good move. “We do get business from it, but we also get a ton of learning because we’re able to speak to people in our same industry who are not direct competitors, because they’re in different locales,” said Cohen. “[It’s] the ability to sit for four days, twice a year, with some of the leading firms in markets around the world, sharing everything from knowledge about consumer trends, human resource needs, and development strategy. Those are just terrific opportunities,” Brown added. Brown originally founded his firm in 1991 under the name H.G. Brown and Associates. He met Cohen a few years later and the two decided to collaborate. Cohen’s background was mostly in communications, while Brown had more experience in public affairs. The two joined forces and the newly christened Brown & Cohen was born in 1997. After spending about a decade working in corporate PR, Brown had reached a point in his career where he wanted to try doing things his own way. Starting his own firm gave him a chance to combine his interests in business, government and media. He also had a bachelor’s degree in journalism from Ryerson University. The timing also seemed right because it was shortly after Ontario’s NDP party won the 1990 election. One of the biggest hurdles to overcome in the early days was finding a way to make Brown & Cohen stand out from the competition, according to Brown. Cohen thinks that difference comes from the firm’s blend of services in media relations, social media, and lobbying. “What we find, and how we differentiate ourselves, is we’re one of the few boutique firms that offer all three services,” she said. Brown and Cohen decided not to specialize in any particular market, in order to keep the firm’s options flexible. Next year will be important for Brown & Cohen, as the annual PROI global summit will be coming to Canada. The summit, coming May 18 to May 22, will be in Quebec City and will likely draw about a hundred PROI partners. Prime Minister Justin Trudeau has been invited to attend, or at least contribute a recorded greeting for the event, according to Brown. At the provincial level, Brown & Cohen is representing clients including the Professional Engineers Ontario, Share the Road Cycling Coalition, and the Ontario Co-operative Association. The firm is not listed on any active files on the federal lobbyists’ registry. “The reason we do more provincially is we’re based in Toronto. That’s number one. Number two… I think the [federal] lobbyist requirements are much more challenging in terms of the reporting structures,” Brown said. Expanding more into Ottawa will be a goal for Brown & Cohen next year, he added. Past files at the federal level show Brown & Cohen has represented the Women’s Brain Health Initiative, Youth Employment Services, the Greater Toronto Marketing Alliance, and the Registered Education Savings Plan (RESP) Dealers Association of Canada.